The printed strings from Workflow Steps should be more informative. Currently, most steps display very generic messages (with the exception of Loaded Script). This applies both to the Console Output as well as the Running Steps page. At minimum, all steps should support a 'label' parameter, which if set should display a custom string instead of the generic messages. It would also be useful if more steps displayed their arguments in their generic message like Load Script includes the filename. Sam Van Oort designed the current version of the Stage View plugin to show all stage steps in the build. My original intention was for it to show only top-level stage steps. 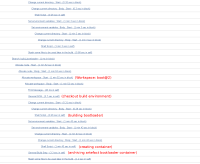 At any rate, no one is expecting to update this plugin to show a more refined view; perhaps Blue Ocean will (TBD). For now, the simple built-in Pipeline Steps is the only full-fidelity display. Jesse Glick added a comment - 2016-11-15 16:42 Sam Van Oort designed the current version of the Stage View plugin to show all stage steps in the build. My original intention was for it to show only top-level stage steps. At any rate, no one is expecting to update this plugin to show a more refined view; perhaps Blue Ocean will (TBD). For now, the simple built-in Pipeline Steps is the only full-fidelity display. Attila Bánfi I've got a concrete proposal with JENKINS-26522 that would allow adding metadata to steps (for example custom labelling), and includes a PR to enable the functionality – currently waiting on Jesse Glick to approve it. That would provide the precursor to what you describe, though it would require additional work to record the additional information to steps and display it. It's quite clear to me that JENKINS-26107 doesn't help your needs really, unless visualization support for nested stages is added. CC James Dumay and Vivek Pandey since it looks like it might be coming up again. Jesse Glick I'm not really sure what you're going on about here, but it sounds like you have some sort of grievance that wasn't voiced previously when design for JENKINS-26107 was happening – I'd encourage you to reach out to talk directly rather than airing it in public JIRAs. Sam Van Oort added a comment - 2016-11-15 18:10 Attila Bánfi I've got a concrete proposal with JENKINS-26522 that would allow adding metadata to steps (for example custom labelling), and includes a PR to enable the functionality – currently waiting on Jesse Glick to approve it. That would provide the precursor to what you describe, though it would require additional work to record the additional information to steps and display it. It's quite clear to me that JENKINS-26107 doesn't help your needs really, unless visualization support for nested stages is added. CC James Dumay and Vivek Pandey since it looks like it might be coming up again. Jesse Glick I'm not really sure what you're going on about here, but it sounds like you have some sort of grievance that wasn't voiced previously when design for JENKINS-26107 was happening – I'd encourage you to reach out to talk directly rather than airing it in public JIRAs. Sam Van Oort Thank you for the comprehensive answer. The JENKINS-26522 looks quite good and is exactly what would help us. I still wonder thet currently there was no need for more detail for analysis. Prehaps our pipeline job is too complex, but it is due to the complexity of our project.